Fourtitude.com - nicholam77's garage "build"
Re: table saw... er... table. You can pick up collapsible hinges that support 330#, so you don't need legs. I'm going to make a table with my miter saw and table saw on casters, and one side will have a collapsible/folding table top. Hmmm, this is a good idea. I figured legs in front would make it more stable overall (when feeding stock through a top heavy cart on casters), but maybe that's a non-issue. The brackets do look easier, although more expensive than wood. I would probably need 3 sets for my plan so ~$60. Re: tool drawer- order some 2" dense foam and 1/2" foam (lay on bottom of drawer) and cut out spots for the tools in the thick stuff. Be legit. Haha. I do want to do this, especially in the Craftsman bench. Part of the problem is I am still accumulating tools and haven't completely organized and come up with a system of where everything goes. I mean I always put stuff back in the same place and it has a designated drawer for now, but there isn't a huge rhyme or reason to it. Sometime when I have time I'd like to do some better tool organization, and incorporate future tools into the scheme. I'd like to keep automotive and woodworking tools separate, and grouped in a logical way (like all measuring and marking tools in one place). I think then I'd be more ready to commit to foam cutouts. That's how we organized the racing tool box. Good way to go. Wrenches and sockets/ratchets in one drawer, organized by size. Screwdrivers, clamps, pliers in the next one. Toe drawer- Toe plates, wrenches, and matching tape measures. Tire drawer- pressure gauge, valve core remover, valve cores, spare valves, tire tape, lugnuts, glue, paint pens. Spent a little time last night finishing my small crosscut sled. Then I measured the resulting board width at the front end and back end of the board. Pretty much 3" dead on. I could hardly believe it. 1/1000th of an inch is definitely within the margin of error of my caliper, so I was pretty pleased with that. I then took that same piece and put the edge that had been just ripped up against the fence of my new crosscut sled and made a perpendicular cross cut. If the crosscut sled fence is squared to the table saw blade the two edges I just cut should be square to one another. Now this is just 1/4" ply so it's not perfectly accurate but I decided I'd proceed with the "5 cut method" anyways. I continued rotating the board and cutting each side until 5 cuts had been made, making sure the last cut was along the long side of the board. It was a little tricky to get completely repeatable results with the caliper, and I feel like the same test with MDF or a hardwood would be even more telling, but that seemed to be the most consistent result. The piece was 16" long so that means after 5 cuts my margin of error over 16 inches is only ~2/1000ths of an inch. I was shooting for 1/1000th off but hey that's pretty damn good so I'm not gonna touch the fence again. The reason I am bothering with all this is two-fold. Firstly I am going to be making some bathroom vanity cabinets out of maple pretty soon and I don't trust my miter saw AT ALL so I wanted to be able to get really accurate and precise cuts on the table saw. Secondly, I have some picture frames to make so I am hoping to either make a miter attachment for the sled I just dialed in, or use my experience to make a dedicated miter sled. I got a router! Dewalt 618. The laser makes easy work of rough dimensions. I only have enough clamps to do one glue-up at a time so doing all 4 sides took most of a day. I laid them out and made markings based on the material and how it lined up vs. arbitrary measurements. Then cut to final length in the crosscut sled. It was very precise. The instructions said to attach the sides to the core with biscuits. I don't have a plate joiner so I got a cheap doweling jig instead. It sorta did the job, but I did not like it at all. I won't be using it again for anything nice because it's almost impossible to hold steady and drill at the same time, and difficult to clamp. Would not recommend. During glue up I realized the pipe clamps I borrowed from my dad were a few inches too short to clamp the long side!! Should have dry fit them first. Oh well, learning things all the time. I'll be using Rockler's plate so to cut the middle out I drilled 4 holes with a Forstner bit and then a jig saw. It's a pretty close fit. The corners aren't perfect like they would be if I bought Rockler's pre-made template for $10 but it's good enough. Next will be sanding the oak flush, giving the edges a round over, and then building the plywood cabinet and MDF fence. It's been awhile and I've been neglecting to update this thread. So here's a pre-winter update. A lot of things have happened. More than what's pictured. Mostly house projects, but those required work out in the garage. I'll try to recap what I've done over the summer and up until now. Installed 185 linear feet of baseboard, as well as replaced 2 interior doors and new casing on 6 doors. The vanity is solid maple with Blum soft-close drawer slights. I did buy the small dovetailed drawers from a cabinet company, but everything else I made. There have been some updates since these pics, but I still need to make another smaller cabinet as well as do some finishing touches. For those unfamiliar it's a DIY version of Festool's MFT table top, which has 20mm bench dog holes precisely machined in a grid so they can be referenced for square, and specific angles. The holes also let you use their ratcheting through-clamps (made by Bessey) to clamp anywhere on the table surface. The "Paulk" portion is the bottom torsion box part that allows you to set tools underneath the work surface. So as you can see the garage and tools have been getting some good use. If anyone wants to take a deeper dive on some of the house stuff I do have a thread over on GarageJournal that has even more pics and explanations. Router table is closer, but I still need to make the fence, table supports, and add switch and dust extraction. So I haven't been able to use it yet. I'm also getting frustrated by how long it takes to set up and clean up if I just want to pop out and do a quick project (moving the cars alone takes 5 minutes), so I have been thinking about redo-ing the miter station and getting the table saw on a proper cart and maybe making ANOTHER mft assembly/outfeed table that's a bit larger. I also have some massive tool organization in mind. It will likely be a long process if I go that route, but I've learned things about what I like and don't like as I've built my workstations and unfortunately there are things I would change or that could be better. I also had my first kid a month ago, and to be able to get anything done on top of caring for her and a full-time job I need things to be as efficient as possible! Last edited by nicholam77; 02-18-2019 at 02:29 PM. wow, those floors came out really great! Thanks! It turned out to be a way bigger project that I had originally planned (that's how it usually goes, right?). Basically aside from the kitchen and bathroom, the main floor space consists of two small bedrooms, an adjoining hallway, and the living room. The bedrooms always had exposed hardwood floors, although they were a glossy honey color and in need of refinishing. The rest was carpet. But the carpet was very high in relation to the wood. So one day I discovered that under the carpet was the dark stained parquet flooring, and after test chipping out a few planks in different places I was fairly confident that the white oak underneath ran throughout the entire space. What I didn't realize, was how difficult it would be to remove the parquet. It was all glued down, and in the alternating pattern the "tiles" that went in the same direction as the oak were almost impossibly to get up. I spent weeks prying it up by hand with a hammer, pry bar, and eventually a demo drill. But it was a huge mess and many late nights and unfortunately I made a lot of holes in the oak beneath because it would rip chunks out of it due to the strong adhesive. By the time I was done it looked really bad and I was worried I'd ruined everything. Then the floor guys came in with their 16 grit sandpaper and after I saw it after the first sand I was a bit relieved. Lots of holes, yes, but seemed salvageable. In total they did 53 board replacements and a LOT of filling with wood filler. They also had to lay new flooring in the whole bay window area because that was an expansion at some point and only had plywood under the carpet. In the end it was still significantly cheaper than all new hardwood, and I was able to save the original floors to the house which was built in 1941, so that's kind of cool. Your hard work paid off though. Flooring is one of those nightmarish things that takes a lot of elbow grease and always has you questioning whether the final product will be worth it. I thought you were nuts when I saw the first pic and the parquet removal comment.. but then I scrolled and the floors underneath came out amazing! Very impressive work, keep it up! I like seeing that you converted the blade guard to a riving knife. That was one of the first things I did to my saw. I’ve mentioned it before, but all tools and work benches are better suited on wheels. Build work benches at specific heights that can double as outfeed tables. Roll the tools outside and keep the mess outside, especially the router table. A leaf blower easily cleans up the sawdust. Personally, I’d buy a dedicated router for the table... you’re going to get tired of continually removing it to use it solo, which happens a lot. You can definitely get away with another base, but as soon as you remove the motor or bit, youve lost your setting. If you need to go back to the table to run the same profile, you’re back to set up. Owning more tools isn’t just about owning more tools... it’s about efficiency. Thanks! It was kinda nuts, and probably could have easily gone very badly. But it was just too temping when I discovered 1 1/4" original white oak underneath! Thanks! Yeah the riving knife came with the saw. Pretty much took the blade guard off immediately, as it gets in the way of small rips and the crosscut sleds / jigs. I really want the table saw in a permanent cart instead of drawer, and a larger outfeed/assembly table on wheels. I really like the MFT paulk thingy I made in function, but it could stand to be larger. So right now I'm thinking new larger mobile MFT table, and new table saw cart, that roll away under a floating miter bench with storage above. I haven't even completed the router table, much less used it, but if I ever get it done and do enough woodworking I'll consider a dedicated router. Right now it's more of a nice to have vs. a strong need but it's a good point. I also thought about getting a trim router for quick roundovers and things like that. I actually do have a second base. The router came with the fixed base, and I got a used plunge base on eBay to make the MFT table. The Dewalt motors do indeed go in and out of the bases very easily. So that's definitely an option. Look into Bosch Gravity Rise stands.... you’ll be storing them against a wall or in a corner. You have a decent sized space and if you get rid of the miter station, that’d free up a lot of room. I have my table saw on a Bosch stand and it’s phenomenal. Sets up and folds for storage in seconds. Stores in a smaller footprint than an “in position” mobile base. It looks like you have a job site saw, but I’m sure it can be made to fit. My miter saw is on a collapsible Delta stand, with a gas lift. It’s quick to set up and stores great, but if the Gravity Rise was available, that’s what I would have gotten. Seems like DeWalt now uses the old Delta design. It’s a bit heavy, and the saw isn’t quick release... I’d personally stay away from it. 15 years ago, this was the best design I could find. Delta and Rigid also have their own versions of Gravity Rise that look decent and bit less money, than Bosch. The Rigid has large wheels, that I definitely like. If you’re going up/down steps, large wheels are great. I'm always working my wood. In a rare moment, I had 2 hours in the garage today. Not much time and nothing specific I needed to accomplish... I've just been really wanting some "shop time" and had an opportunity. I decided to go for something quick and simple -- making some support arms for the router table build. As luck would have it I had only 1 piece of plywood large enough. To get a straight edge I ran it through the table saw in my "straight edge" jig. It was something I put together really quickly this past summer. I'd like to make a better one sometime. Then I did some layout. My in-laws got me this Woodpeckers TS-12 square for the holidays and I've been waiting to try it out. It works great for drawing perpendicular or parallel lines to an edge. Slightly tricky to use on narrow pieces like this but can see it being really useful on larger pieces of plywood. Some quick sanding and they are good to go. They slide into the slots in the bottom of the cabinet to support the fold down table. To screw in the other "side" of the slot this little Bosch pocket driver came in handy. I wasn't sure how much I needed a compact driver at first, but it's proved to be very useful so far due to its size and weight. I far prefer it to my full size drill. I still have a fair amount of work to do to complete this project (build a custom fence, wire power tool switch, dust collection, make shelf dividers and storage for router accessories, and maybe some paint? ), but it feels good to accomplish something! It feels like a long time since I've done any "woodworking". This weekend I messed around with my latest tool acquisition, a Makita Track Saw. I went back and forth a LOT on whether this would be useful to me, and I decided it would and sold some other stuff on eBay to make it happen. I have plans to build some built-ins, bookcases, and cabinets for the house - projects that require sheet goods, in the near future. Hopefully some this summer. I love my DeWalt table saw, but its so tiny it's basically impossible to crosscut sheet goods larger than 2'x2' safely and accurately. Also, I'm hoping to be able to use the track saw indoors during the winter or to be able to bring the tool closer to the project, if the dust collection and noise are acceptable. Anyways I just took the time to set it up and test it so I could throw the rather large box away. First I cut the splinter strip which was easy enough. When holding my 36" woodpecker rule against it (straightest thing I own) it appeared no gaps and didn't rock at all. Nice and straight. Next I tested with the vac and dust deputy. I aligned the track near the edge of the MDF, to create a very dusty cut. The dust collection performed VERY well. Another thing I love about this saw is it is MUCH quieter than the table saw. I could see myself being able to use this indoors. Just in these brief tests I am very impressed with this saw. Expensive, yes. Can similar results be achieved with a circular saw and straight edge? I suppose with some effort. I've done that before with my circular saw and I can say that the Makita product is much easier to use and seems to be basically fool proof. In a stroke of luck, I got off work early today and was able to spend about 3 hours in the garage. I decided to keep working on the router table. A LONG time ago I had bought some t-track for attaching the future router table fence, so I thought I would install that, finally. At first I was worried this Woodpecker 12 inch T-square would be an awkward size. Too large for working with small boards, and too small for working with sheet goods. But so far it's been pretty useful. It's so easy to lay out perpendicular and parallel lines very precisely. My plunge router wouldn't fit under the cabinet shelf so I had to take the table surface off to route the dados. Since I had it apart, I decided to fix an issue I had previously when installing the lag screw "hinges". One of the oak sides separated when putting the screw in, so I sanded down the surfaces and re-glued it. I'd like to get another organizer piece, and put the screwdrivers on the wall where they are easily accessible and not rolling around in a drawer. I cut the plywood on the table saw and then rounded the corners with a jigsaw and orbital sander. Then I glued a riser for the back row of drivers. Ok, back to the router table. With it back intact, I started routing the dados. Set the plunge to a hair deeper than the t-track. Then I used the t-track itself as a straight edge guide, pinned down by the Festool quick clamps. I've really come to like these clamps as they are very versatile. I overshot my line a bit. To square up the stop dados I had to do some chiseling with my crappy Home Depot chisels. I'm not very good at chiseling, and my chisels are cheap and NOT sharp, but I did watch a YouTube video recently and tried to improve my technnique. It's just something I've hardly ever had to do so I don't have much practice. Not horrible, I guess. Like a lot of shop projects I've made, it's functional, but not perfect aesthetically. I cut the t-track on the miter saw and screwed it in. I have yet to make a proper fence, but here you can see the Festool clamps actually fit the t-track so I can just clamp a straight board in the meantime. I brought both projects inside the house to apply some finish when I can get to it. 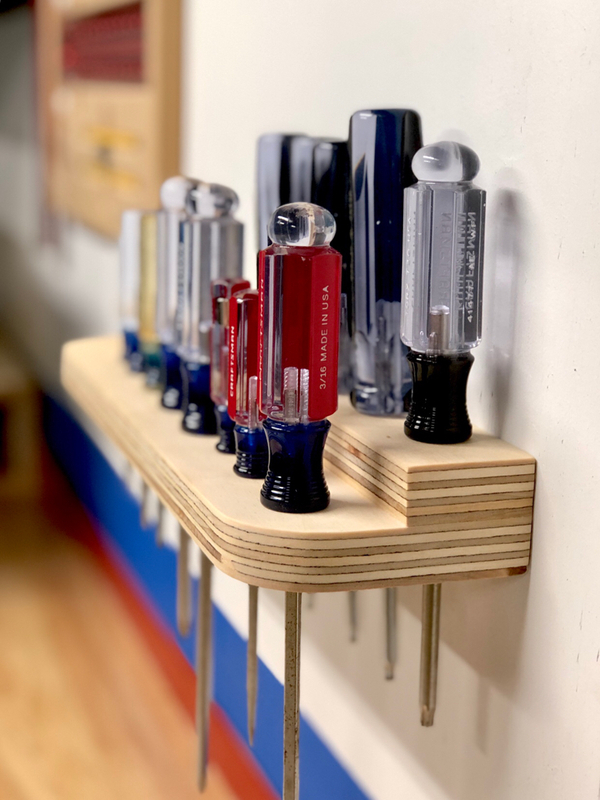 I finished the screwdriver holder today. I filled a few voids with wood filler and then did two coats of minwax clear wipe-on poly. There’s some extra room for a few more drivers if needed. A very simple project but I really like how it turned out. 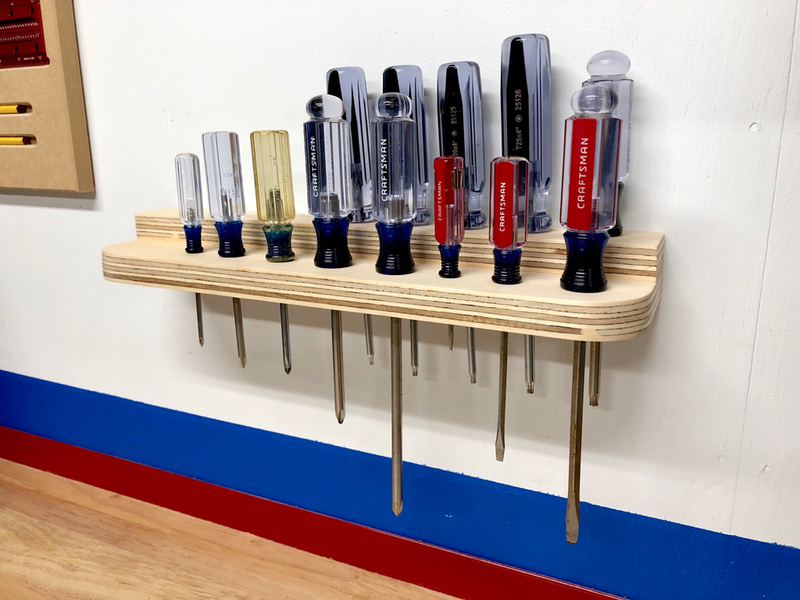 I’m now inspired to make more tool holders and get stuff off my workbench. 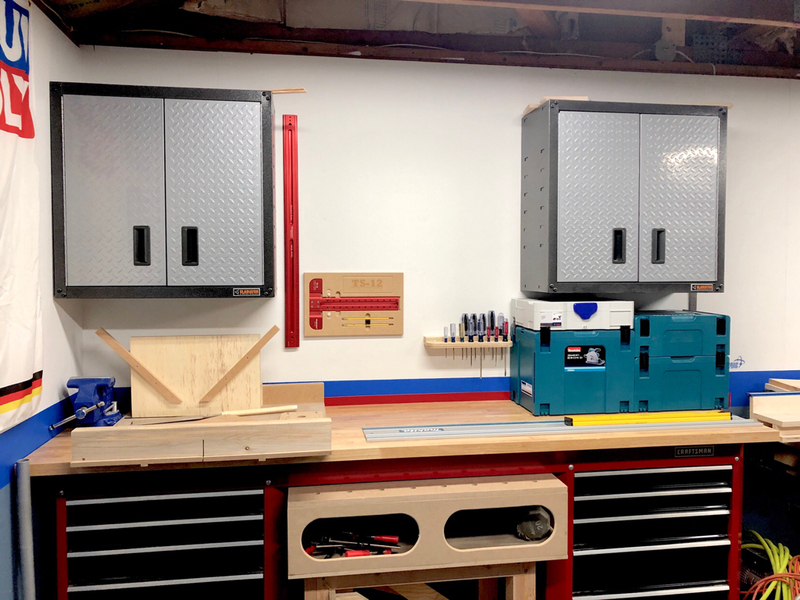 Even though I’m a person who really likes to be organized, I’ve put off organizing my workbench drawers or hanging stuff on the walls because I felt like I was still acquiring tools and didn’t know where to start. With the screwdriver holder I think I realized I just need to start somewhere, even without a complete plan in place, or it will never happen. I need to get those sleds and jigs on a wall somewhere. I think ideally there would be nothing on the Craftsman bench, so it can be a surface to set things (like building materials) when I’m actually doing a project.